The vaulted space of the Florentine “Stazione Leopolda” is going to host the main event “Pitti Uomo”, commemorating this year the centennial of Trussardi, an Italian luxury brand which started off as a humble glove maker at the beginning of the 20th century. Its creative director, Milan Vukmirovic, has devoted the brand his whole leather collection ranging from the chamois V-neck shirts to the soft suede trenches. The right homage to the Trussardi brand includes an exhibition called 8 ½ ( 13th January -6th February) on the foosteps of Fellini’s famous film, hinting at the years of patronage of contemporary art from the Trussardi Foundation. Thirteen artists are here showing their works: Darren Almond, Pawel Althamer, John Bock, Martin Creed, Tacit Dean, Michael Elmgreen & Ingar Dragset, Urs Fischer, Peter Fischli and David Weiss, Paul McCarthy, Paola Pivi, Anri Salameanin. The introduction to the exhibition is the installation at the entrance of the site. The encouraging neon writing by Martin Creed “Everything is going to be alright” sounds like an ironically enthusiastic welcome to the visitor. 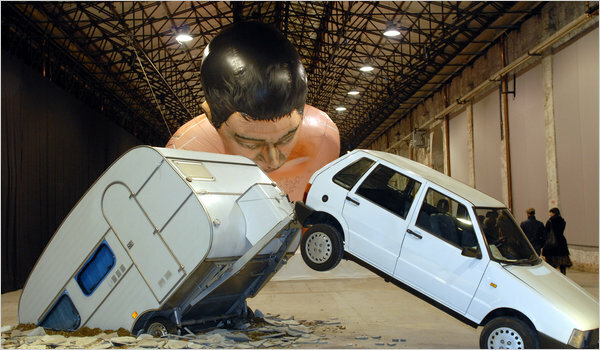 Inside he will be surprised by curious or controversial works such as a white car with its caravan sprouting from the floor or the gigantic twenty metre balloon floating in the air, the larger- than -life portrait of the artist Pawel Althamer. A privileged position is represented by Maurizio Cattelan’s work, a double self-portrait, reproducing two corpses with eyes wide shut, titled “We” . It is on show in Italy for the first time . “A detached reflection on the meaning of death and the frailty of life” somebody says. The cooperation between the artist from Padua and the brand is not new, it dates back to May 2004 when three life-sized puppets, barefoot and open-eyed hung from an oak in piazza XXIV Maggio, a historical spot in Milan, shocking the unaware passers-by or drivers, who thought they were real. Strongly linked to the double self portrait by Cattelan, the two films “Still Life” and “Day for night”, directed by Tacita Dean where she turns the studio of the painter Morandi into a cinematic fresco. The epilogue must not be missed , a mise-en-scène, simultaneously playful and dramatic typical of the Theatre of the Absurd, represented by the mysterious crowds by Paola Pivi. They are even more enigmatic than Pinter’s characters because even Pinter’s unreal plot is missing. Martin Creed’s promising words have failed our expectations. Better for the guests to hurry along to the special anniversary menu of haute cuisine, to the journey of the senses, prepared by the brand’s restaurant chef, Andrea Berton from the “Ristorante Trussardi Alla Scala” relocated to Florence for the occasion. For accommodation we recommend our web site http://www.tuscanyholidayrent.com. The choice is wide, it ranges from various flats in Florence to charming or luxury accommodations in the Tuscan countryside.